The most popular pole bean of all. Long, round, slightly curved pods are borne in clusters. stringless and tender when young, the medium green pods are rich in flavor. Can be grown on poles, fences or trellis. Pole Beans may be grown on a fence or trellis and the seed planted in a row. For highest quality and yield, pick pods when young, about 3-4 inches long. Thinning - When plants are 2 to 3 inches tall, thin leaving strongest plants 8 inches apart, or 3-4 plants around each pole. 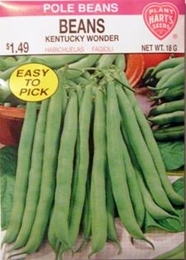 Bulk Pole Bean seed available. 70-90lbs of Pole Bean seed needed per acre. Average Pole Bean yield per acre - 172 bushels.